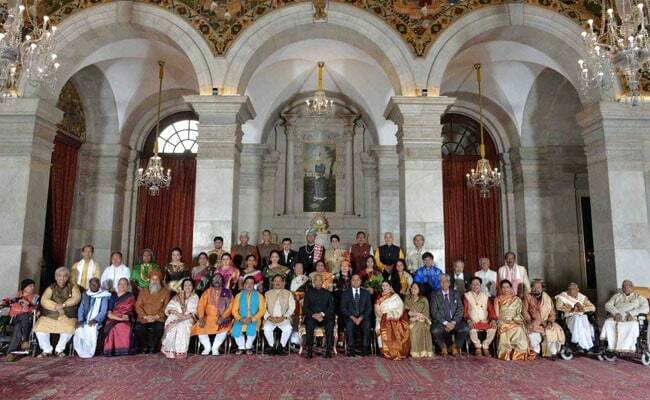 President Ram Nath Kovind presents Sangeet Natak Akademi Awards at the Rashtrapati Bhavan. Noted flautist (flute player) Rajendra Prasanna, Kathak dancer Shobha Koser, folk singer Anwar Khan Manganiyar, and Odissi dancer Sujata Mohapatra among others were conferred the Sangeet Natak Akademi Awards by President Ram Nath Kovind today. Rama Vaidyanathan for Bharatnatyam, Shobha Koser for Kathak, Madambi Subramanian Namboodiri for Kathakali, IN Oinam Ongbi Dhoni Devi for Manipuri dance, Deepika Reddy for Kuchipudi, Ramkrishna Talukdar for Sattriya, Janmajoy Saibabu for Chhau, and Ashit Desai (composer) received the award. Janmajoy Saibabu appreciated the recognition granted after “a continuous struggle for 47 years”. “Of course the field is full of struggle but the joy of bringing your state’s culture in front of people is beyond words. I am hopeful that after seeing the art of chhau getting recognised more young people will come forward to keep it alive,” Janmajoy Saibabu said. Anwar Khan Manganiyar for Rajasthani folk music, Prakash Dahadeo Khandge for Maharashtra’s folk arts, Jagannath Bayan for Assam traditional music (Khol), Ramachandra Manjhi for Bihar folk music, Rakesh Kumar Tiwari for Chhattisgarh folk theatre, Parvathy Baul for West Bengal folk music (Baul), Sarvjeet Kaur for Punjabi folk music, KC Runremsangi for Mizoram’s folk music, Mukund Nayak for Jharkhand folk music, and Sudip Gupta for West Bengal puppetry were awarded in the category. “Every child that is born in Rajasthan is born with music in his blood, but they also have to follow in the footsteps of their fathers, grandfathers to continue this legacy. I am thankful to the government for recognising the artistes and their art,” Anwar Khan Manganiyar said. Sandhya Purecha for her overall contribution and Vijay Verma for his scholarship in the field of performing arts also received the award.